In addition, a newly-formed task group issued 103 fines after surveying sites and investigating dumped bags. SINCE DECEMBER 2012, 271 fines have been issued for illegal dumping in Dublin’s north inner city area. The figures seen by TheJournal.ie come after Dublin City Council (DCC) announced the formation of a pilot task group to come up with ways to cut down on the level of illegal dumping in the city. They also come after DCC announced that it may be suspending street cleaning temporarily in parts of the city which are ‘blackspots’ for illegal dumping. The move is part of an effort to tackle illegal activity around rubbish in the capital. Councillor Cieran Perry told TheJournal.ie that dumping is particularly bad around the Blackhorse Avenue area, saying “every second night things are dumped there”. The North Inner City Litter Action Group (NICLAG) was established on 7 January 2013. It is a council-run pilot group that is examining a specific number of streets where dumping is particularly bad, and it is drafting a report with its recommendations for what can be done about tackling the issue. The main report is due this summer. Since NICLAG was formed, an additional 103 fines were issued after the group surveyed sites and investigated dumped bags in specific areas of the north inner city. He was told that between 400 and 500 dumped bags were removed on a weekly basis, and it was not possible to give an accurate cost for this alone as it is dealt with as part of the day-to-day duties of existing salaried staff. 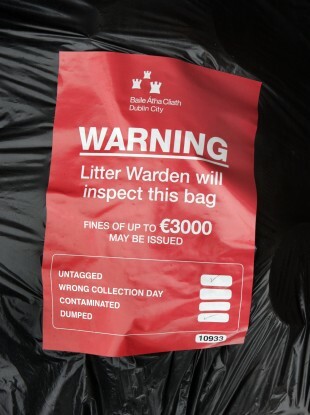 He was also told that a minimum of 20 per cent of bags identified by the litter wardens were investigated for evidence and at that point approximately 12 per cent of bags investigated in the previous month contained evidence that was of sufficient quality to issue fines. Email “271 fined for illegal dumping in Dublin's inner city since December”. Feedback on “271 fined for illegal dumping in Dublin's inner city since December”.